They are a form of financial assistance awarded to students based on specific criteria that has been determined by the donor or organization providing the funds. 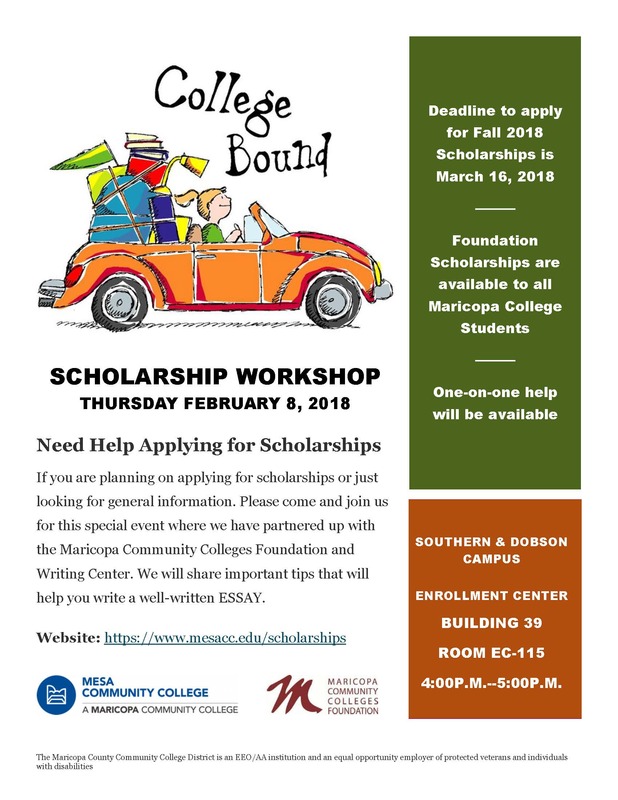 If you would like to apply for Mesa Community College scholarships you would apply online via the Maricopa Community Colleges District Scholarship Database. Mesa Community College (MCC) Students can complete one general application online and be eligible for multiple scholarships automatically. The Maricopa Community Colleges District Scholarship Database is a tool that can help you to search for college specific scholarships, district wide scholarships, or external scholarships in cooperation with Maricopa Community Colleges. Students can complete the general application and determine if they want to complete any other opportunities that they may be eligible for. You can begin your application here. If you have any questions on the Maricopa Scholarship Application, please send an e-mail to scholarships@domail.maricopa.edu. College Specific Scholarships–Mesa Community College (MCC) offers scholarships to students that are specifically for students attending MCC. Scholarships are available online. Students can complete one general application online and be eligible for multiple scholarships automatically. These scholarships are privately funded and open to all Maricopa Community College students. In most cases they may be used at any Maricopa Community College and, in some cases, non-Maricopa colleges and universities. A Free Application for Federal Student Aid (FAFSA) is not required to apply. Apply for Foundation scholarships or check the status of an application. The Foundation has two main scholarship cycles in February and September of each year. These scholarships are offered through various local and national organizations. Free scholarship search engines are available to aid in your search for funding and enhance your knowledge about financial aid. These scholarships are offered through various local and national tribal agencies. Students must apply directly through the tribal agency they are affiliated with. For additional information you must contact the tribal agency directly.